Agreement to Establish and Operate "AVIC-ESI (Beijing) Technology Co. Ltd."
BEIJING--(Marketwired - May 30, 2013) - ESI Group, pioneer and world-leading solution provider in Virtual Prototyping for manufacturing industries, announces the signature of a Joint Venture contract with BIAM, the Beijing Institute of Aeronautical Materials. Under the terms of the contract the parties agree to establish and operate the Joint Venture company "AVIC-ESI (Beijing) Technology Co. Ltd." to address the important needs of China's aerospace and astronautics industries for Virtual Engineering. Signature of this contract completes actions initiated by a strategic partnership agreement in June, 2011 and the signature of a Joint Venture framework agreement in November, 2012. BIAM, a core scientific Research Center of AVIC (the Aviation Industry Corporation of China), is China's only institute for research in advanced materials and manufacturing technologies for aeronautical applications. Through its subsidiary BAIMTEC Material Co. Ltd it is also an important supplier of titanium castings and other manufactured components to global companies including Airbus, Boeing and Safran-Snecma. Within the frame of the Joint Venture, BIAM's expertise in the manufacturing, testing and characterization of advanced materials and components will complement ESI's strengths in Virtual Manufacturing and Virtual Testing, to support the enhancement and effective deployment of Virtual Prototyping. Stated ambitions of the Joint Venture include providing leadership in the application of Virtual Engineering for innovative product development and serving as an example to other Chinese high technology enterprises. The event marking the signing of the Joint Venture contract was held at BIAM's principal establishment in Beijing and joined by an official representative of the Ministry of Industry and Information Technology (MIIT) of China, by representative Executives of many business units of AVIC, including AVIC Foundation Technology Institute (AVIC TECH), BIAM, and by ESI Group. Opening the proceedings, Dr. Dai ShengLong, President of BIAM reviewed the evolution of the collaboration over the past two years and emphasized the mission to "co-create up-to-date solutions based on innovative materials and digital prototyping" and to "continuously generate new IP with commercial potential". The purpose of the joint venture is not only to catch up but "to leap ahead, propelled by virtual technology". Dr. Alain de Rouvray, Chairman and CEO of ESI Group expanded on the theme of Dr. Dai, noting that, in particular, ESI's global and strategic automotive customers are in several important domains significantly ahead of the aerospace sector in their use of Virtual Product Engineering, allowing them to spur innovation and manage drastic reductions in product development costs and delays. "Our commitment is to apply our expertise and global resources to achieve a world leading position in delivering innovative digital based solutions, enabling China's aviation sector to benefit from the best in class digital engineering and then gradually influencing other industry sectors as needs emerge". Then, Mr Rong Yichao, Chairman of the Board of AVIC TECH and President of AVIC Foundation Technology Institute congratulated the parties on the formation of the Joint Venture, especially as he recognized ESI as the leading CAE software company in Europe. He highlighted that AVIC has a strategy to actively participate in the global aviation industry chain, stating that "Our cooperation with ESI is a big step forward towards this goal, and the Institute is ready to support the Joint Venture in any manner that will assure its success". Finally, Mr. Li BenJian, Deputy Director of the Equipment Manufacturing Industry of MIIT likened the cooperation between AVIC-BIAM and ESI to two strong hands joining together. He reminded the audience of the government requirement to "quicken the combination of information technology and industrialization", expressing the hope that the Joint Venture will "use and promote digital technology to upgrade the present structure of the Chinese aviation industry". He instructed AVIC to use the Joint Venture to set an example for other industries to follow. 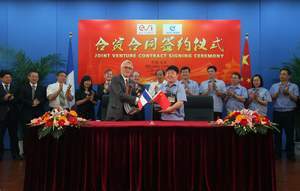 Subject to final approval of the relevant Chinese authorities, the business of this new Chinese Joint Venture company, AVIC-ESI (Beijing) Technology Co. Ltd. will include the commercial distribution of ESI's Virtual Engineering standard software solutions; associated hardware for computation and immersive visualization; related technical support services and validation engineering studies. Also projects of "co-creation" will be defined that could allow emergence of new solutions with a potential for distribution both in China and through the global distribution network of ESI Group. The scope of activity will be within the Aerospace and Astronautics industrial sectors and other related and mutually agreed organizations to which AVIC-BIAM provides essential materials and technology services. The parties reaffirmed their conviction that their many technical synergies and the spirit of team work evident since the signature of the strategic partnership in 2011 give cause to believe that the new venture will rapidly prosper and will bring sustainable success and concrete mutual benefit. ESI Group has been directly represented in China since 2004 by a subsidiary company and currently has offices in Beijing, Shanghai and Chengdu, and today has customers in diverse industry sectors. In addition to activities that support business in China, ESI China maintains a team in Shanghai that is dedicated to development of advanced computer models for use in the automotive industry for passenger and vehicle safety assessment, including human models and crash barriers. ESI China will continue to develop independently its activities in China outside the aerospace and astronautics sectors, and to address directly the local needs of its global customers, most especially those in the ground transportation and energy industries. ESI is a pioneer and world-leading provider in Virtual Prototyping that takes into account the physics of materials. ESI boasts a unique know-how in Virtual Product Engineering, based on an integrated suite of coherent, industry-oriented applications. Addressing manufacturing industries, Virtual Product Engineering aims to replace physical prototypes by realistically simulating a product's behavior during testing, to fine-tune fabrication and assembly processes in accordance with desired product performance, and to evaluate the impact of product use under normal or accidental conditions. ESI's solutions fit into a single collaborative and open environment for End-to-End Virtual Prototyping. These solutions are delivered using the latest technologies, including immersive Virtual Reality, to bring products to life in 3D, and real-time process management solutions; helping customers make the right decisions throughout product development. The company employs about 1000 high-level specialists worldwide covering more than 30 countries. ESI Group is listed in compartment C of NYSE Euronext Paris. For further information, visit www.esi-group.com.